After a busy day working offshore, and for those weather days when you aren’t able to get to site, you will want to relax in accommodation that is clean, convenient and comfortable. Finding a place to stay that is not only within budget and a close distance to your site, but also has all of your preferred facilities can take time. This is why we believe we are the right people for the job! 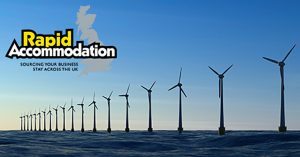 We’ve put together the Rapid Accommodation essential guide to booking accommodation for the offshore wind and renewables industry. We understand how important it is for employees, technicians and contractors to be close to site, so checking travelling distance is a must. A key part in this is monitoring any nearby roadworks that may affect your journey, as well as any tolls. This helps to reduce the chances of any nasty surprises as you travel to work. As a worker in the offshore wind sector, WiFi is a necessity. Accommodation will need to have WiFi access so you can check your emails and shift patterns, as well as keep in touch with your family and friends while you are away. Not to mention streaming your favourite box sets and scrolling through Facebook to keep you entertained during any downtime! Every worker has their own personal preferences and may have their own specific facilities or localities in mind. For example, a Siemens engineer that is working at Lincs Wind Farm and staying near the Operations and Maintenance base in Grimsby may want to be close to a modern, 24-hour gym and the town centre for evening entertainment. An essential part of a quality accommodation finding service is taking the time to source available rooms that are close to preferred amenities with an easy travelling distance to site and are within budget. This is where our expertise comes in, knowing where to look for accommodation that meets all your requirements and your costings. Having to review and compare the options sent to you takes time in itself, which is why an essential part of the service is ensuring you only receive the most suitable options. In the offshore wind and renewables industry, we understand that weather days and last minute moves to other sites may mean your accommodation needs to be cancelled, which can be a hassle. When this happens, our team are ready to cancel the rest of your stay and to work with the accommodation provider get a refund or achieve the best possible outcome due to your immediate departure. For more information about Rapid Accommodation’s services for the offshore wind and renewables industry, give us a call on 0330 090 41 42.